Have You Visited the Tech Trails? Now’s the Time! 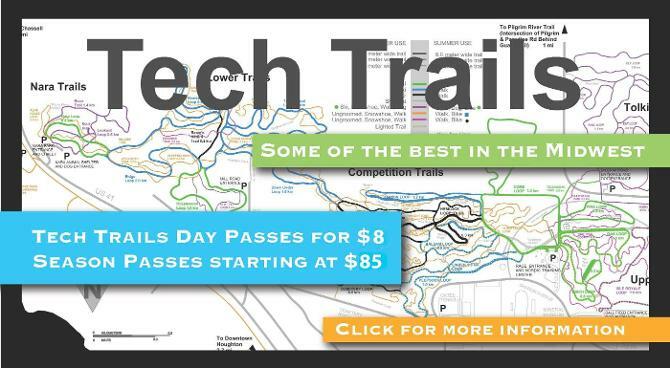 Have you visited the Tech Trails lately? Now is a great time to see everything the trails have to offer – some of the best cross country skiing trails in the Midwest! Not to mention snowshoeing and biking! Try it for a day or go all out with a season pass! A season pass to the trails costs next to nothing and will help keep you fit all winter long! For more information on the Michigan Tech Trails, visit Michigan Tech Trails. For students and families, avid athletes and novice gym goers alike, Community Programs offers awesome options to fit your personal fitness level and style. In the studio, pool or on the ice, youth classes will keep your little husky active, engaged and having fun. New to Community Programs? Want to change up your workout? Try out a Spring class for only $2 during Dollar Days, January 12-17! Adult Fitness Schedule – We’ve got an awesome line up of fitness classes to ward off the chill and get you ready for warmer weather! Variety of Yoga classes, Turbo Kick, Pilates, Zumba, Aikido, Spinning, Conditioning, PiYo, Aqua Zumba, Belly Dance for Fitness, Aqua-Fit, Swimming and Skating. Youth Classes – Ward off spring fever and keep your child fit and active! Choose from Hockey, Skating, Swimming, Aikido and Dance. Community Programs has something for everyone. 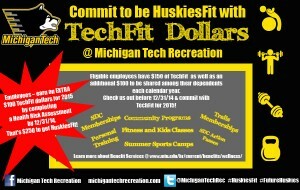 For more information on class schedules and prices, visit www.michigantechrecreation.com. On Facebook at Michigan Tech Recreation and on Twitter at MichiganTechRec. Join us anytime and COMMIT TO BE TechFit! Michigan Tech will be hosting the Midwest/Great Lakes Junior National Qualifying Race on December 20-21. NOTE: Only the following trails will be open to the public for skiing on December 20-21: Isle Royale, Superior and Nara Loops along with the Tolkien Trails. Lace Up & Join Big Red on the Ice December 20! ​Santa is coming to town Saturday, December 20 from 5:00-7:00 p.m. in the MacInnes Ice Arena! Dress up in your most festive Christmas apparel for a chance to win the Holiday Cheer Costume Contest! Play on-ice reindeer games & have your picture taken with Big Red! Santa’s elves will be around to help beginner skaters. Come skate and be merry! We also invite you to come early and enjoy the holiday figure skating recital featuring skaters from the Copper Country Skating Academy and Michigan Tech Learn to Skate! For more information, visit Skate with Santa. There’s Still Time! 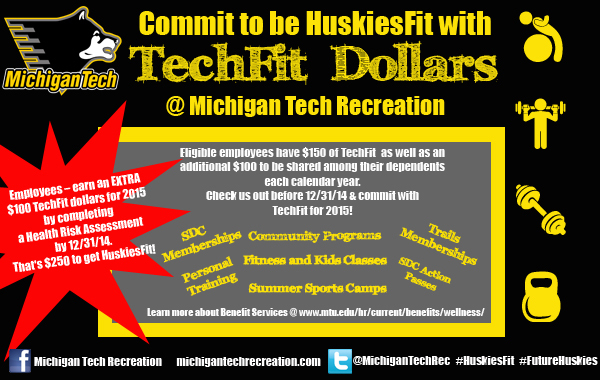 Commit to be HuskiesFit with TechFit Dollars! ​There are many ways you can put your TechFit dollars to work for you and your family. SDC memberships, personal training sessions, community programs, fitness and kids’ classes, summer sports camps, trail memberships, and SDC action passes are just some of the ways you can use your TechFit dollars. Have you used your 2014 TechFit dollars? Eligible employees receive $150 for themselves as well as an additional $100 to be shared among dependents each calendar year. Don’t let them go to waste! AND you can earn an extra $200 for 2015 by getting your annual physical and completing the Health Risk Assessment by 12/31/14! That’s $250 to get Huskies Fit! For all the latest information on SDC and trails memberships, personal training, camps and community programs, visit us online at www.michigantechrecreation.com, on Facebook at Michigan Tech Recreation, and on Twitter @MichiganTechRec.